Issue #72 of my Crochet Inspirations Newsletter is about “long tail crochet”: crocheting with a long yarn end instead of just weaving in a shorter one to make it disappear. As promised in that issue, below is the full size comparison chart of crochet foundations in order of stretchiness. All but the first two and last two examples can be considered long tail crochet foundations. (Same yarn and hook size used for all of them). See issue #72 “Long Tail Crochet” for clickable versions of links shown, and more. Hand chaining is when you crochet chain stitches with your hands and fingers instead of with a crochet hook. It’s also called finger crocheting. Hand chaining is so easy! Kindergartners do it. It’s a popular way to crochet trendy necklace-scarves with fancy yarns in under 30 minutes. You might have learned hand chaining as a child in kindergarten, at camp, or from a babysitter. It’s often taught as a stand alone activity rather than as an introduction to the larger world of crochet, knot tying, or knitting. I don’t even remember how I learned it. I just already knew how by the time I officially learned how to crochet with a hook at the age of nine. For the next blog post I viewed several videos that show how to do hand chaining as a crocheter, a knitter, or a knot tyer. It left me with a new way of thinking about the origins of crochet. Hand chaining is so fun to do that even experienced crocheters are at risk of getting “hooked” (if they remember to try it). It’s often forgotten as a crochet method even though it offers nuanced control over unusual yarn combinations for edgy, artsy effects. I get new, deeper insights into simple stitches when I hand crochet them, thanks to the intimate, tactile experience of crocheting. Hand chaining a special subset of crochet that merits a closer look than it usually gets. Hand Chaining loosely vs. tightly. L to R: Satin cord, wool knit tube yarn, suede lacing. Hand chaining cuts out the middleman (er, the crochet hook). This is perfect for crochet beginners! Learning to use a new tool with yarn loops for the first time takes the focus off of the stitch. Shouldn’t getting to know a stitch be the most important part of learning to crochet? Especially when that stitch—the chain stitch— is the foundational core of all crochet? I think so. The crochet hook is the one central tool of crochet. When researchers encounter an unfamiliar fabric, they consider the tool used to create it. An item made with a crochet hook is usually classified as crocheted. I wonder how hand-chained items are classified. Hand chaining straddles two worlds: Crochet, and Knot Tying. The same basic crochet stitches can be made with hand chaining as with a crochet hook: Chain Stitch, Slip Stitch, and Single Crochet. (Other stitches are more of a struggle without a hook.) The fingers or the whole hand simply take the place of the crochet hook. Perhaps hand chaining came first, at least in some early cultures, and the crochet hook evolved to substitute for hands and fingers. Launder climbing rope so that it can be easily machine washed, allowed to dry, and then “unzipped” for use afterwards. Even if you already know how to crochet, I think Chain Stitch In Depth and other posts about crochet basics offer some new ways to think about our most basic and important crochet stitch of all, the Chain Stitch. Updated November 2018. It’s part of an experimental blog post series: Vashti’s How to Crochet Book. Next post: Hand Chaining How-To’s. Categories: Trendy Crochet, Vashti's Crochet Book, blogged! Classic Slip Knot (left), Simple Crossed Loop (right). Either one works. View larger. Let’s really look at how we start crocheting, and why we do it this way. Most of us learn to make a slip knot that gives you your first loop (called a slip loop) that you can tighten or loosen a bit to fit nicely over your crochet hook. Later, some of us may alter the beginner’s slip knot, depending on the project. We may start crocheting in the round with a magic ring instead; or we might undo it later because that starting knot is too noticeable in the yarn we’re using. Some crocheters loosen it and crochet the last stitch of the row into it. Over the next few posts I contrast the advantages of the standard slip knot with some alternatives. Are you a beginner? Head over to this post first so that you’re clear on the best way to make the standard starting slip knot. The simple slip knot we all learned as beginners is one of two types based on which yarn end tightens the slip loop. Which one we learned matters. A slip knot is not required at all, but it’s helpful if you’re a beginner. The knot part is optional. Compare the two starting loops in the image above. Frankly, you don’t even need a crochet hook or a specific kind of yarn. Isn’t this a remarkable thing about crochet? Musicians need to tune their instrument first, and weavers need to string a loom first. Even knitters need to cast on more than one loop. The minimum a crocheter needs to start crocheting is a yarn end looped around a hook (or your finger if finger crocheting). When a simple loop has crossed ends, you’ve already got a starting loop for crochet. See it in the photo above? When you think about it, all of crochet is based on loops with crossed ends. A quick and easy way to think of this Crossed Loop is to imagine that you’re writing a cursive letter “e”. You can do it in the air or “write” with the yarn on a table. See how the Crossed Loop in the photo above could be a cursive “e”? Pinch and hold a Crossed Loop with the fingers of your left hand where the yarn crosses itself. It now appears that two strands are hanging down from your hand. With your right hand, pick up the strand on the right that crosses in front of the other strand. Bring it around behind your loop. Bend it so that you can pull a new loop through the first loop, from behind. Leave it sort of loose, and set it down. Two kinds of yarn shown. Slip knot is loose on the left and tighter on the right. View larger. Turn it around, pinch and hold it with the fingers of your right hand where the yarn crosses itself. Or, you could write a cursive “e” backwards. It now appears that two strands are hanging down from your hand. With your left hand, pick up the strand on the left that crosses in front of the other strand. (See below.) Bring it around behind your loop. Bend it so that you can pull a new loop through the first loop, from behind. Leave it sort of loose, and set it down. For Lefties. Two kinds of yarn shown. Slip knot is loose on the left and tighter on the right. View larger. Slip Knot: It’s a Chain Stitch! You’re already crocheting. When you pulled the bent or “looped” strand through the initial loop, you finger-crocheted. You can see why some crocheters just leave the knot loose and crochet into it like it’s one of the foundation chains. 1. The Crossed Loop is one loop away from being a Slip Knot. Once you pull a new loop through a simple Crossed Loop, just tighten it to reveal that it’s actually a Slip Knot. (To tighten, pinch the loop and tug on the other strand to watch the knot tighten around the loop.) Notice that you can also adjust the loop size of the Slip Knot, and the knot part preserves the size of the loop. 2. 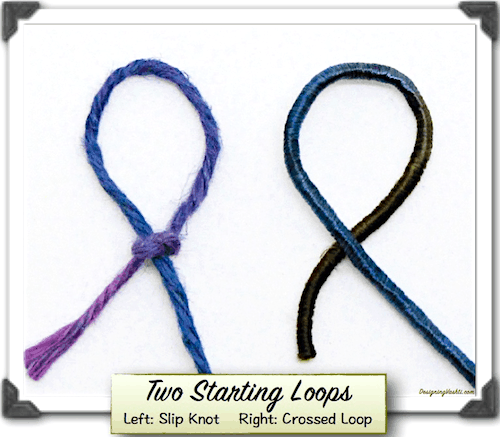 The Slip Knot is the standard, official way to start crocheting, especially for beginners. This is probably because beginners also usually start crocheting with a crochet hook in their hand (as opposed to finger crocheting). The Slip Knot is great for this. You can tighten its loop around a crochet hook and wave it around like a magician. It stays put. Very handy! 3. Once you pull a loop through an initial Crossed Loop you’ve crocheted. A Crossed Loop is a fine start for any crocheting, when you’re ready for it. 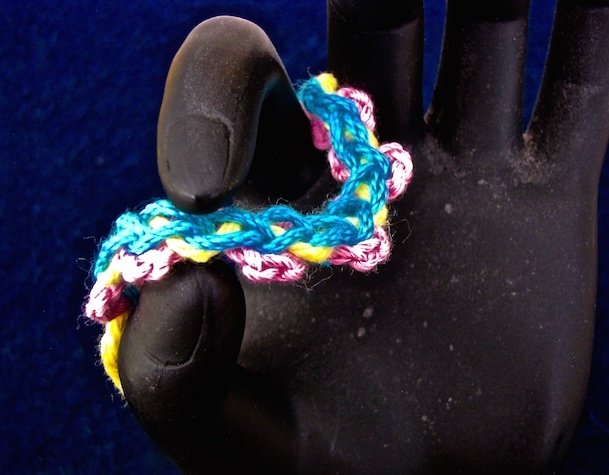 For finger crocheting, you wouldn’t need a Slip Knot to keep a loop on your finger because you can easily hold it. Just keep pulling a new loop through the next loop and you’re crocheting. 4. Chain stitches are self-knotting at the starting end. It’s another reason that a Slip Knot is not essential, it’s optional. Try it: undo the initial Slip Knot after you’ve crocheted some chains. Tug on that starting yarn end and the very next chain stitch automatically becomes the new starting knot. This is why some crocheters can leave the initial knot loose and undo it later. Updated November 2018. It’s part of an experimental blog post series: Vashti’s How to Crochet Book. Next post: Starting with the Best Slip Knot. Categories: Crochet How-tos, Whys, Vashti's Crochet Book, blogged! Introducing: Vashti’s How to Crochet Book! A compound braid of simple crochet stitches. View full size. I invite you to join me as I try an experiment: what is it like to write an in-depth crochet book, post by post, right here on this blog? I’m excited to show you what I’ve come up with! The working title is Vashti’s How to Crochet Book. I don’t see it as being a typical how-to-crochet guide. My vision for it is that it goes step by step, more deeply and thoroughly than any other I know of. (I’ve read a hundred or so.) It’s for beginning crocheters and the rest of us. It could even be for aliens. Surely there’s an extraterrestrial who’s trying to learn how to crochet. Sometimes I feel kind of rushed along when reading about how to crochet basic stitches. I have lots of why questions, including why do I feel rushed? Rushed toward what? taller stitches? Finished projects? Maybe it’s just that no book can be big enough for what is really going on with crochet loops. May this be the place for beginners to get solid answers to how to crochet at each step. Stuck at the beginner level? Surely there’s a way to explain things that finally clears up confusion. Here’s an example: I’ve noticed that crochet relies on simple terms like loop or chain that actually have multiple meanings. This can confuse some folks when they’re not spelled out. Please let me know in the comments how I can do even better. If you already own a crochet how-to book, great! Some of them are designed to be sweet portable project companions. Come back here to fill in the gaps, answer your why questions, or just to see if a different point of view enriches your understanding. Know How to Crochet Already? Knowing what’s in the usual how to crochet book won’t make any of us crochet experts. Crochet is too big to fit in a book; it’s even too big for one person to master 100% of it! Another way I think of it is, every crocheter is a beginner at some part of crochet. This is why I see the standard crochet skill levels as more of a spiral than ranked levels. A how to crochet book has not yet been blogged and I can’t resist a good experiment. A blog allows me all the room I need. It’s ambitious. To avoid getting overwhelmed, I’m blogging a section at a time. This first section is all about initial fundamentals, which are often taken for granted the most. I want to write crochet books and not disappear from my online crochet communities while I do so. This way the book gets written publicly. I also want it to be interactive. Please leave comments! This page was updated November 2018. It’s the first post of an experimental blog post series: Vashti’s How to Crochet Book. Next post: Why I’d Want to Learn How to Crochet. 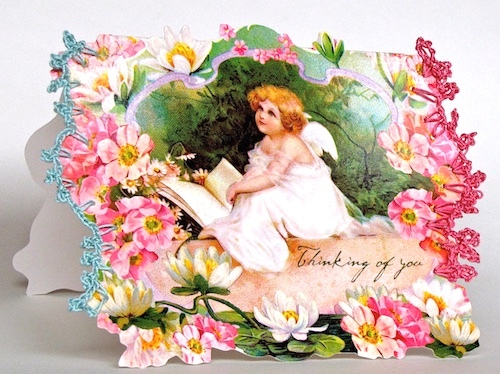 Isn’t this greeting card crochet experiment lovely? I made it about four years ago. The recipient was touched by it. I’m glad I took a photo before I gave it away—I smile whenever I see it. The first step was to punch tiny holes randomly spaced along a portion of the card’s irregular edges. Instead of poking holes with a needle, I found a 1/16″ single hole paper punch at my local craft store. I’m glad I did. The holes are clean-edged and look like the card came with them. Randomly spaced holes can vary in distance from each other, and from the edge of the card. When you’re crocheting into these holes, you just have to chain more to get to a hole that’s farther away, and chain fewer to get to a closer hole. In standard pattern language, this is eyeballing (i.e. freeform), because it’s adjustable instead of being a fixed pattern. This automatically puts it in the Intermediate Skill Level category. Sometimes I slip stitched (sl st) into a new hole, then chained one (ch 1) so that I could sl st again into the same hole. The picot petals are just long picots. I added extra chains before the sl st or single crochet that closes the picot. Greeting card crochet is a useful Intermediate Level skill to know for other kinds of crochet too. I’ve listed a few other links below to other crocheters’ blog posts about greeting card crochet edgings. Each blogger describes a similar step of adjusting the number of chains to accommodate the space between the holes.